I’ve already shared a couple of posts of fabulous fabric shopping locations in London – the Cloth House and Liberty of London. By no means am I the expert on all the great sewing shops in London, but I there were a few other shops and spots that I hit during my short stay that I thought inspiring and share-worthy. Another great resource for Liberty of London fabrics is Shaukat in South Kensignton. (Thanks to all those who recommended it!) This was an easy walk from the Fat Quarterly retreat through a smart (posh) neighborhood in London. The other great benefit there was they had a big stack of remnants and scraps. Liberty lawns are on the pricey side – but can go such a long way, so scraps are very useful. I had fun digging through the scrap pile with Cristina, Gunilla and Helene, who were also at the FQ Retreat, and found some gems. I also splurged on 2 half metres of two of my all-time favorite Liberty prints. But so many good ones got left behind… Now to figure out what I’m going to do with these two. Another favorite classic English stop was the Cath Kidston shops. I’ve been a total sucker for Cath’s style for a while now and those shops are so full of my kind of color and inspiration. I love the haberdashery dept at Cath’s. Lots of pretty fabrics and notions to inspire. The pictures from this Cath (as well as the shop with crocheted sewing machine at the top) were taken on Marleybone High Street. Though I’d heard of it before, this was my first time visiting this part of London. And it was lovely! I little less hustle and bustle than other shopping areas of London with cute, quaint little boutique shops and restaurants. Lots of adorable children’s shops in that area. Maybe it’s where the next royal baby’s new wardrobe will come from. I’m kicking myself though because I missed The Button Queen and VV Rouleaux on nearby Marleybone Lane. 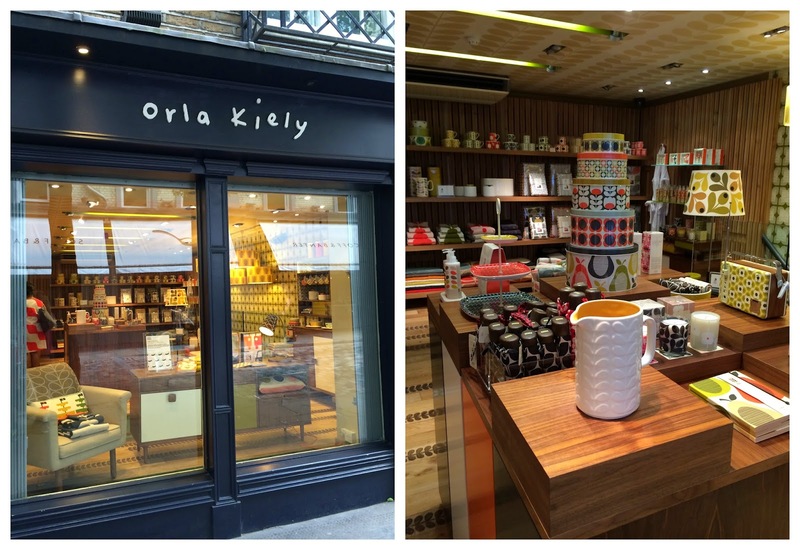 We passed the Orla Kiely shop near Covent Garden on our walk to the British Museum one day. My family was not in the mood to stop so I let them keep going. (This is the reason this shopping post is not super comprehensive.) I ran in just long enough to take a picture and feel inspired. It was still worth it as Orla is one of my favorites. This list is by no means the be all and end all of sewing-inspired shopping in London, but it’s a start. Feel free to add more in the comments so we can make this post a more comprehensive resource. And so I have a list of other places to be sure not to miss if (fingers crossed = when!) I get a chance to go back. Post Edit: I didn’t make it outside central London, but here is a great round-up of quilt shops in the greater London area from the London Modern Quilt Guild. For fabric shopping in other big cites check out these posts for fabric shopping in Paris and fabric shopping in New York City. 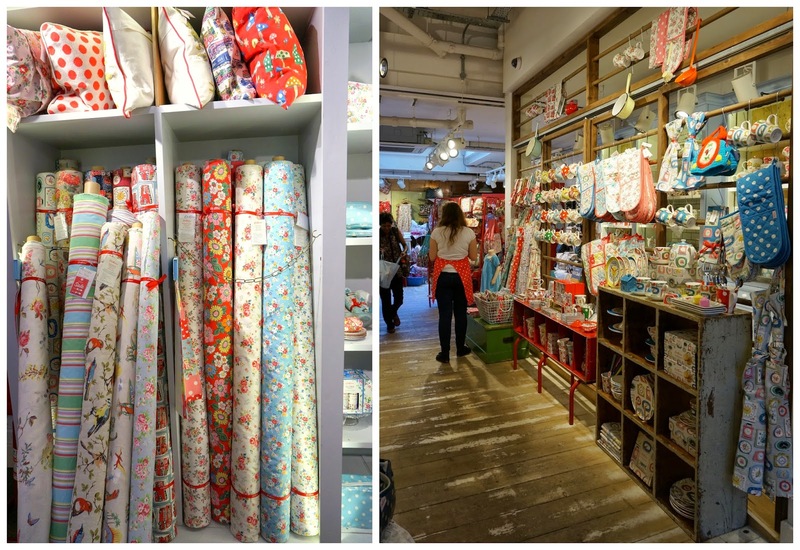 This post makes me want to go to London just for fabric shopping! Love your London shopping posts. I would spend hours there. Now I want to board a plane and fly across the pond. Gosh, maybe I could go on a crossing on the Queen Mary 2. . . . I have finally bought some Liberty of London fabric and the only thing I am wondering is what brand of solid fabric will go with this fine fine fabric. Fine meaning silky…thinner..than what I usually use. It almost feels like a rayon fabric, it is that fine. Really good question! I&#39;ve been pairing my Liberty&#39;s with Michael Miller Cotton Couture solids. They&#39;re a little more light weight and silky like the Liberty laws. Hi Amy! London and the FQR was great! And yes, I am still dreaming of Shaukat…;) it was so nice meeting you, the class you had was great (I am sewing EPP stars now). Take care!!! Oh wow…Such a dream to be there and to see, touch, smell and walk in all those shops and places…and those photos… so glad you are sharing them with us. Oh great…It&#39;s just my dream to be there in fresh air and to see all of those shops and places full of amazing fabrics with unique designs. This post force me to go to London just for just fabric shopping. Oh my gosh – I love that Liberty print on the far right of your remnants and scraps picture! Do you know that one is? 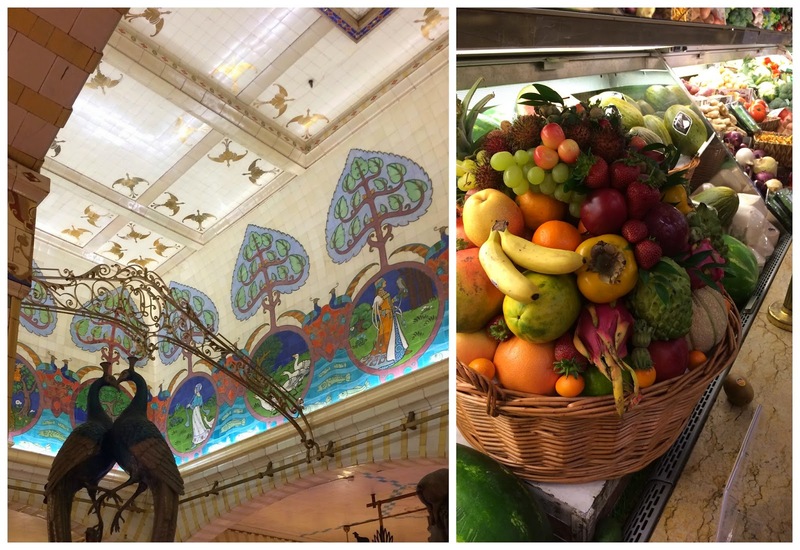 Oh, the Harrod&#39;s ceiling! I have that same photo! We still talk about the macaron case. I am craving a scone and clotted cream. Thanks, Amy! Oh my – I live in West London and didn&#39;t know that Shaukat was there – and so close to me. I have a free day on Sunday and that&#39;s where I&#39;ll be heading! Scraps of Liberty lawn – heaven! Just got back from the UK. Thanks to your Instagram posts, I visited Shaukat and loved it. Also enjoyed Liberty and Cath a Kidston. Lots of fabric purchased! A friend is in London for the next 10days for her job, she was wondering where the fabric shops are so I forwarded your post to her. Thank you! I visited Shaukat and loved it. Also enjoyed Liberty and Cath a Kidston. Lots of fabric purchased! Wow! I am going to London in November and was wondering where I might find some fabric stores, and have loved reading your post and making notes of what you found. Can&#39;t wait to go exploring when I get there! This looks like &quot;if you had a free day and could do anything you wanted, what would you do?&quot; for me! So fun! Glad you got to explore so many lovely shops, especially the wonderland cave that is Shaukat! One of the best collection , These are amazing. Super creative and imaginative and all things that are good. Thanks for sharing.